Z-Drive - LamaLo Technology Inc. The T/B Dorothy Ann was built in 1999. The original propulsion system consisted of two fixed pitch Z-Drive thrusters each powered by a 20 cylinder 645 EMD-E7B Engine. The thrusters were upgraded to controllable pitch (CPP) type. Each thruster is rated at 2647 kW (3550 HP). The engine rated speed range is 315 to 900 RPM. There were shafting and vibration problems since the original build. Premature failures of bearings occurred and excessive vibrations existed at speeds higher than 830 RPM. Typically two (2) bearings failed each year. LamaLo Technology Inc. was contracted by Interlake Steamship Co. to provide Specialized Engineering Analysis and Measurement services with respect to the propulsion shafting bearing failures, vibration and alignment. The shafting system design, vibration measurements and maintenance history was reviewed, and theoretical analyses of the static alignment and lateral vibration conditions were conducted. Strain gauge alignment measurements were taken and analyzed. Recommendations for changes to the design arrangement and realignment were provided. The changes were fully implemented in 2017 and the shafting was realigned. The shafting and bearing performance has now been reported to be acceptable. 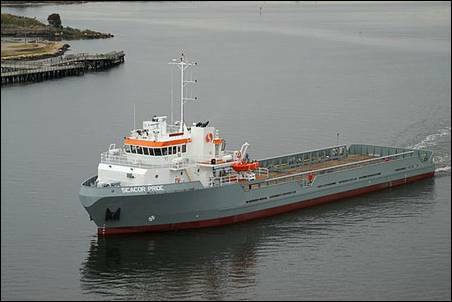 The MV Seabulk Angola is a 165' (50 m) anchor handling tug (AHT), constructed in Indonesia. The propulsion system has two Z-Drive thrusters (port and starboard). Each thruster is driven by a diesel engine, with a rating of 4,000 HP (2,970 kW) at 750 RPM. Each lineshaft is approximately 42' (12 m) long and is supported by four cylindrical roller bearings, with one bearing “fixed” to prevent axial motion of the shaft. There is a stub shaft that connects the main engine to the lineshaft, which is about 60" (1.5 m) long and is supported by two roller bearings, with the aft bearing also being a “fixed” bearing. All the fixed bearings over-heated on the propulsion shafting both during sea trials and transit. During the first week in June on voyage to Africa the starboard lineshaft fixed bearing temperature over-heated so the vessel returned to Singapore. LamaLo Technology Inc. (LLT) was contracted to determine the source of the high temperatures and what would be required to reduce the temperatures to acceptable levels. This was accomplished by a combination of theoretical modeling, design review and assessment, and on-site measurements and observations. The source(s) of bearing failure were identified. The design of the shafting was modified the bearings were aligned using the strain gauge technique. 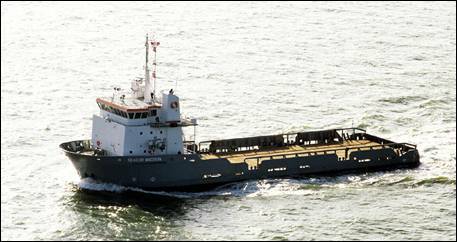 The vessel returned to service in July 2005 and has since operated without incident. 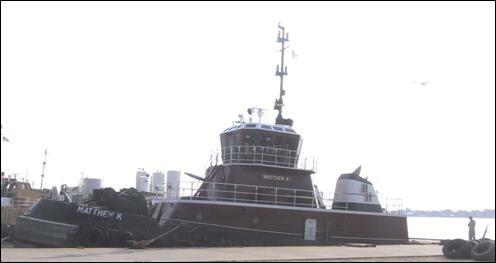 The Seabulk MV Energy Hercules Class vessels are 96' Thruster Tugs constructed at Eastern Shipbuilding in Panama City, Florida. The propulsion system has two Z-Drive thrusters (port and starboard), each driven by a diesel engine, with a rating of 1,838 HP at 1600 RPM. Each lineshaft is approximately 14' long and is supported by 5 spherical roller bearings. The forward end of the lineshaft connects directly to a torsional coupling supported in a flange housing complete with double spherical fixed roller bearings. LamaLo Technology Inc. was contracted to ensure that the propulsion shaftline design and installed alignment condition would be satisfactory for all modes of operation. This was accomplished by a combination of theoretical modeling, design review and assessment, and on-site measurements. The last of five (5) vessels was delivered in 2007. The shafting systems on all vessels have operated without incident. Three (3) 250' Offshore Supply Vessels (OSVs) were constructed at Leevac Industries, LLC in Louisiana. The propulsion systems have two Z-Drive thrusters (port and starboard). Each thruster is driven by a diesel engine, with a rating of 2575 HP at 1600 RPM. Each lineshaft is approximately 5.0 m (17') long and is supported by 4 roller bearings. The second bearing from the forward end also acts as a fixed bearing, to carry axial loads on the shaftline. The forward end of the lineshaft connects directly to a torsional coupling supported in a flange housing complete with a double spherical fixed roller bearing. LamaLo Technology Inc. was contracted to ensure that the propulsion shaftline design and installed alignment condition would be satisfactory for all modes of operation. This was accomplished by a combination of theoretical modeling, design review and assessment, and on-site measurements. The last vessel was delivered in 2008. All vessels have operated without incident. A 216' Offshore Supply Vessel (OSV) was constructed at Leevac Industries, LLC in Louisiana. The propulsion system has two Steerprop SP14 Z-Drive thrusters (port and starboard). Each thruster is driven by a diesel engine with a rating of 1,575 HP at 1600 RPM. Each lineshaft is approximately 3.65 m (12') long and is supported by 4 roller bearings. The forward end of the lineshaft connects directly to a torsional coupling supported in a flange housing complete with a double spherical fixed roller bearing. LamaLo Technology Inc. was contracted to ensure that the propulsion shaftline design and installed alignment condition would be satisfactory for all modes of operation. This was accomplished by a combination of theoretical modeling, design review and assessment, and on-site measurements. The vessel was delivered in 2007 and has operated without incident. The MV Beesecker, a 150' Push Boat, is under a major repair / retrofit, which includes the installation of a new propulsion system at Bollinger Quick Repair. An entirely new stern is being fitted to the vessel after removing the conventional shaft line and kort nozzles. The new propulsion system has three Z-Drive thrusters. Each thruster is mechanically driven by a diesel engine with a rating of 1520 kW at 1000 RPM. Each shaftline is identical, with an aft lineshaft that is about 34' long and supported by 6 roller bearings, and a forward lineshaft that is about 17' long and supported by 2 roller bearings. LamaLo Technology Inc. was contracted to ensure that the propulsion shaftline design and installed alignment condition would be satisfactory for all modes of operation. This was accomplished by a combination of theoretical modeling, design review and assessment, and on-site measurements. The vessel was delivered in 2006 and has operated without incident. Four Tidewater Class and three Seacor Class vessels were built at Bollinger Shipyards Lockport, Louisiana, USA. The propulsion system has two 2375 HP (1771 kW) Z-Drive thrusters (port and starboard). Each thruster is driven by a diesel engine, with a rating of 2,375 HP at 1600 RPM. Each lineshaft is approximately 15 feet long and is supported by 4 roller bearings. There is a stub shaft that connects the main engine to the lineshaft, which is about 42 inches long and is supported by 2 roller bearings. The primary objective of this work was to ensure that the propulsion shaftline installed alignment condition was satisfactory for all modes of operation. This was accomplished by a combination of theoretical modeling, design review and assessment, and on-site measurements. Theoretical alignment and whirling vibration analyses were conducted prior to the installation of the shafting system, and an alignment procedure was produced and followed. The strain gauge technique was used to conduct the final alignment of the lineshaft bearings. Using this technique the bearings were positioned within ± 0.004" of their prescribed locations. The maximum static bending stress on the shaft was measured to be less than 700 psi. The last of the vessels was delivered in 2004. The alignment performance of the shafting has been reported to be acceptable. 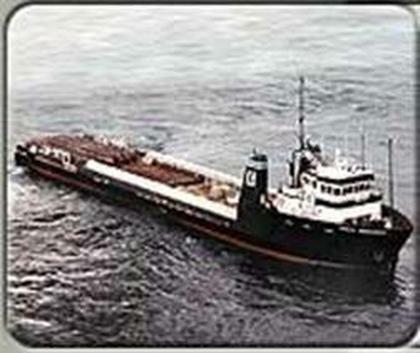 The vessel was constructed at VTHalter Marine Moss Point. The propulsion system has two Z-Drive thrusters (port and starboard). Each thruster is driven by a diesel engine, with a rating of 2,000 HP at 1600 RPM. Each lineshaft is approximately 20 feet long and is supported by five roller bearings. The forward end of the lineshaft connects directly to the torsional coupling complete with a flanged housing and support bearings. The vessel was delivered in 2003. The alignment performance of the shafting has been reported to be excellent. The MV Point Clear is a 98.5' foot state-of-the-art 5000 HP “tractor tug” with a bollard pull of 75 tons. 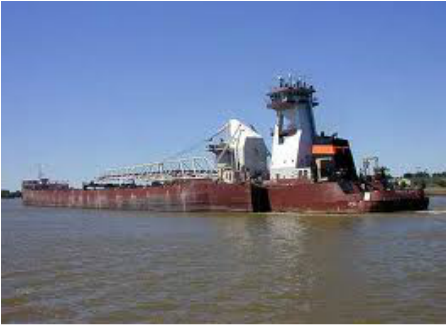 The vessel works in the Mississippi River. The propulsion system consists of twin Z-Drives with nozzled propellers, each driven by a diesel engine rated at 2500 HP at 1000 RPM. The lineshaft is support by three Cooper split roller bearings and there is a stub shaft aft the main engine with two support bearings. LamaLo Technology Inc. was contracted to determine a least-cost solution to repeated lineshaft bearing failures. Work focused on determining the shafting system alignment and vibration characteristics, and isolating the source of the higher temperatures. This was accomplished by a combination of theoretical modeling, design review and assessment, and on-site measurements and observations. It is concluded that the failures were likely due to an excessive misalignment of the bearing pedestal to the cartridge. The bearing pedestal was realigned to be parallel to the cartridge. Since this work was conducted, in March 2004, the alignment performance of the shafting has been reported to be excellent. MV Ensco Captain: A number of damages occurred to the propulsion shaftline bearings after delivery. An investigation was conducted to determine the source(s) of failure and an optimum solution. It involved a combination of theoretical modeling, design review and assessment, and on-site measurements. The investigation concluded that the failures were due to a lineshaft misalignment condition that resulted in a top-loaded lineshaft bearing, excessive shaft bending stresses, and excessive lineshaft bearing offsets. A realignment of the shafting system (January 2002) resulted in acceptable vibrations, and no further failures have occurred. MV Ensco Commander and Navigator : As a result of the experiences on the MV Ensco Captain, it was recommended that subsequent vessels include the strain gauge alignment technique as part of the alignment procedures. The shaftlines were aligned in 2002. Since then, the alignment and vibration performance of the propulsion shaftlines have since been reported to be excellent. MV Ensco Admiral: The vessel was delivered in early 2001. In January 2003 all the lineshaft bearings over-heated and were damaged. 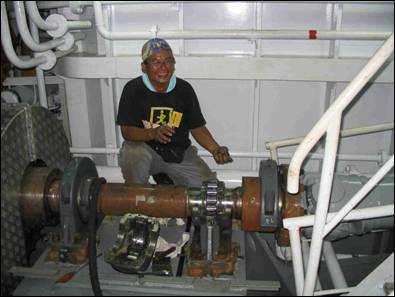 Experience with similar failures in January 2002 on the MV Ensco Captain, which is the same class of vessel, showed that the root cause of failures was misalignment of the lineshaft bearings. The shaftline was realigned in January 2003. Since then, the alignment and vibration performance of the propulsion shaftline has since been reported to be excellent. An investigation was conducted to determine the source(s) of vibration and an optimum solution. It involved a combination of theoretical modeling, design review and assessment, and on-site measurements. The investigation concluded that the excessive shaftline component vibration amplitudes were due to a lineshaft misalignment condition that resulted in a top-loaded lineshaft bearing, excessive shaft bending stresses, and excessive lineshaft bearing offsets. A realignment of the shafting system (August 2002) resulted in acceptable vibrations. Propulsion System Failure Investigation to determine cause of failure of machinery components and recommendations for a complete solution. The recommendations were carried out in the spring of 2000. Subsequent operations resulted in a re-occurring failure due to a “design flaw” which was previously noted by LLT. New main engines better suited to the vessel’s operational profile were installed in the spring of 2002. A complete realignment of the shaftlines was conducted in the fall of 2002. Vibration measurements taken by LLT during sea trials were acceptable, and the performance of the vessels machinery and shaftline bearings have since been reported to be acceptable. The vessels have two Z-Drive type thrusters (port and starboard), each driven by a diesel engine with a continuous rating of 3,020 HP at 2000 RPM. Each propulsion shaftline is approximately 32 feet long and is supported by 7 lineshaft bearings. 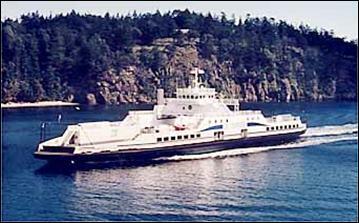 The MV Lynn Marie was completed in the spring of 2001, after which a number of damages occurred to the propulsion shaftline bearings. An investigation was conducted to determine the source(s) of failure and an optimum solution. It involved a combination of theoretical modeling, design review and assessment, and on-site measurements. The investigation concluded that the failures were due to a lineshaft misalignment condition, and improper type of bearing lubrication. A realignment of the shafting system, and modification to the lubrication system on one lineshaft bearing resulted in acceptable bearing performance (November-January 2001). Further bearing failures occurred in 2004. Visual inspection and measurements of the bearing parts, support structure, chocking, assembly and disassembly was conducted. It was determined that the bearings housings were significantly distorted due to a non-uniform chocking support across the base of the bearing pedestal. This distortion was considered to be the cause of the recent bearing failures. 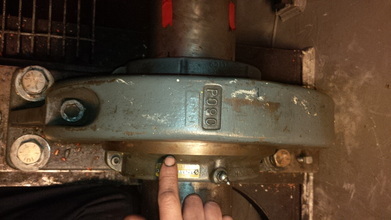 Both shaftlines and all bearings were disassembled and re-aligned using the strain gauge technique, damaged bearings were replaced on each shaft, and all bearings were re-chocked. The vessel returned to service in July 2004 and has since reported excellent shafting vibration and alignment characteristics. 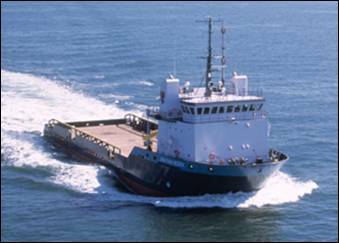 As a result of the experiences on the MV Lynn Marie, it was recommended that subsequent vessels include the strain gauge alignment technique as part of the alignment procedures for the sister vessel the MV Marshall Foss. The shaftlines were aligned prior to delivery in December 2001. Similar to the sister vessel MV Lynn Marie, modifications were conducted to one of the lubrication system on a lineshaft bearing shortly after delivery. As of the summer of 2004 the alignment and vibration performance of the propulsion shaftline has since been reported to be excellent. Shaft alignment and vibration analysis and measurements during construction and delivery. Responsible for ensuring the shafting system was aligned properly. This involved conducting a theoretical analysis, determining alignment criteria, producing shafting installation procedures, and measuring the installed alignment condition. The vessel was delivered in the summer of 2000. The bearings on the stub shaft from the main engine over-heated during long transits. This problem was rectified and the alignment and vibration performance of the propulsion shaftline has since been reported to be acceptable.